The SAT is an expensive and difficult business. It’s particularly tough if you’ve been out of high school for a while. Fortunately, there are circumstances in which both the test and the fee can be waived. However, to fulfill either, you’ll need to write a letter explaining your specific situation. Here’s how you can make it convincing and polished. The SAT is one of the most popular college preparation tests in the nation. The typical tests involve writing, reading, and math. However, there are also twenty other special subject tests in five different areas. Generally, anyone applying to most American universities will need to take the basic SAT, and may perhaps need subject tests if their program requires it or if they wish to demonstrate special knowledge. If you need any of these waived, how can you write good waiver letters? Here’s our advice. When writing your waiver letter, follow this simple guide and you will find it much easier. Skip down two lines and write the name and address of your letter’s recipient. Skip down one line, and then write an introduction. Include who you are and what you’re asking for. Skip down another line and then write a body. This should be one or two paragraphs and should give supporting evidence as to why you need a waiver. Add another short paragraph thanking the recipient for their time. Skip two lines and then add a closing, such as ‘Sincerely’ or ‘Regards’. Type your name four lines below. Print out the paper and sign in the space between the closing and your printed name. Find out the main rules of writing IELTS waiver letter, to be aware about all the secrets! Here are five tips for writing a waiver letter you can be proud of. Outline: Copy the structure we gave you and fill in the parts bit by bit, so you know you’re on the right track. Proofread: Have someone else look over your letter to remove embarrassing mistakes. Include names: Addressing your letter ‘To whom it may concern’ will leave a bad taste in your reader’s mouth. Find their name. Understand requirements: If you don’t fully understand why waivers are granted, you can’t be convincing. Be concise and quick to the point: Don’t include too much irrelevant detail. State your request and the most important information first. 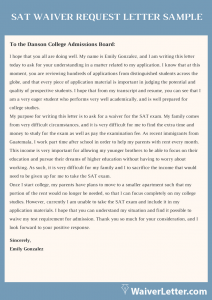 The SAT or LSAT waiver letter can be a major source of stress in many students’ lives. Even writing a waiver letter can seem an insurmountable obstacle if you’re alone. That’s why we offer help for students. Allow our staff of professional writers to assist you and you’ll find the task much less arduous. Don’t go on struggling by yourself anymore. Here are the suitable advantages of operating with our crew. The best quality of work: you would by no means locate any type of inappropriate or meaningless content within the responsibilities written by means of our team. The written content material is good from all the factors. Trusted services: they’re trustworthy and able to create the satisfactory content material unfastened from plagiarism and with timely delivery. We handiest opt for working inside the style this is sincerely required by the valuable customers. Timely delivery: We will entire the pressing orders without making the postpone of little while. Therefore, we are the first-rate preference for getting your waiver letter achieved. If you need a fantastic SAT waiver letter, contact us and let us handle the tricky parts.